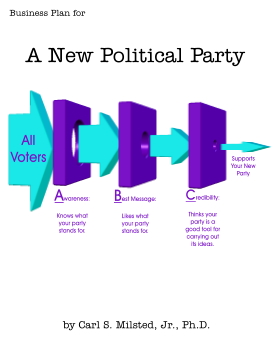 We have three rules for successful third party politics in the U.S. A party that follows all three has a chance. A party that breaks one of them is doomed to irrelevance. As long as we view politics in terms of a left-right political spectrum, these rules contradict one another! A centrist party can obey Rules 1 and 3 but breaks Rule 2. A semi-radical conservative or liberal party violates Rule 3. An extremely radical liberal or conservative party can fulfill Rules 2 and 3 while violating Rule 1. A party can survive with meager success by obeying Rules 2 and 3 while breaking Rule 1. Consider the membership dynamics of a new conservative party. Such a party could be appealing to many activists. However, many of those activists will continue to support the Republicans due to the lesser of two evils dilemma. The activists most likely to join/stay in are those who see little difference between the Democrats and Republicans. Yes, the Democrats are worse (for these activists), but the difference is tiny to one far out on the right fringe. Thus, over time we can expect a party like the Constitution Party to radicalize to the right. The same holds for the Greens, albeit to the left. The Libertarian Party has also radicalized because of this mechanism, but its radicalism also stems from other factors: its ideological origins in axiomatic philosophy and its membership pledge. In theory a libertarian party could survive closer to the center, because libertarianism is not on the left-right axis. 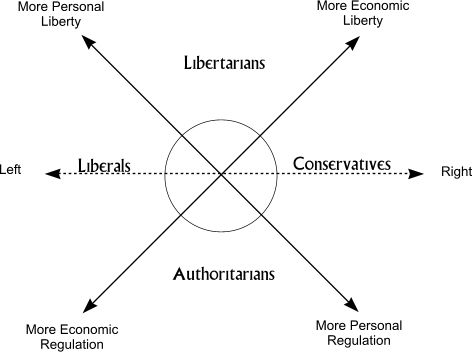 Libertarianism is about politics in more than one dimension. From the beginning libertarianism has been about breaking away from left-right politics. Eventually, this became formalized by David Nolan with his famous Nolan Chart. According to this chart, liberalism is about increasing government control of the economy while reducing government control over personal behavior. Conversely, conservatism is about decreasing government control of the economy while increasing government control over personal behavior. Libertarianism is about decreasing government control of the economy and over personal behavior. 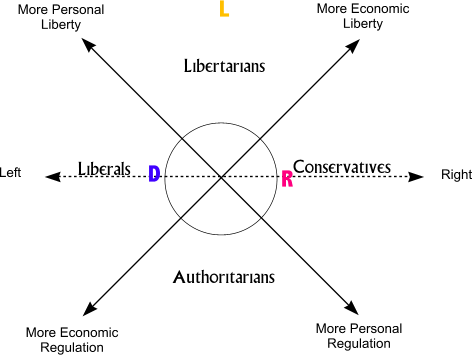 From a purely left-right perspective, the Libertarian Party is in the center; it is a moderate party of sorts. Thus, in theory the LP could fulfill Rule 1. Moreover, it is a coherent subset of moderates, thus fulfilling Rule 2. (An authoritarian party could also meet both of these criteria, for the same reasons.) Finally, the Libertarian Party supports a mix of liberal and conservative positions. Some who ascribe to such a mix are equally dissatisfied with both the Republican and Democratic parties. Thus, the Libertarian Party should be able to fulfill Rule 3. So, according to the previous paragraph, the LP fulfills all three rules. According to my theory, the LP should be much bigger than it is. So, is the theory wrong? No gun restrictions whatsoever – including personal nukes. No taxes other than user fees. Elimination of all pre-emptive regulation. Punishment for harm cannot proceed until after harm has occurred. Thus no meat inspections, consumer safety regulations, etc. Torts only. No foreign aid or foreign intervention unless the U.S. has already been attacked. The Libertarian Party was not a moderate party. It was near the extreme top of the Nolan Chart. That said, the LP has run some moderate candidates at various levels. Some of them have won. (So have some extreme candidates.) One reason why the LP has been able to field moderate, mainstream candidates is that the party does attract a fair number of moderates. The Libertarian octant has room for people close enough to the mainstream to be able win elections. When the LP recruits using the World’s Smallest Political Quiz, it declares many moderately libertarian takers to be “libertarians.” Some of them join the party and become active, because they are otherwise politically homeless. That is, they are dissatisfied by both the Democratic and Republican party messages (Rule 3). Alas, the purists among the radicals in the party who work diligently to drive out moderates who express their views at conventions. The membership oath gives them a weapon to do so and they use it. For this reason, the Libertarian Party has floundered despite having the potential to become big. I joined the Libertarian Party back in 1981 when I was a callow anarchist who found Murray Rothbard’s words to be philosophically beautiful. I stuck with the Libertarian Party even after I matured and became more realistic, because the LP is at least close to a sweet spot. But I got tired of losing so I went all in trying to get the Libertarian Party to move to the sweet spot that it claimed to be at from time to time. I went all in and launched the Libertarian Reform Caucus with help from friends in the Buncombe County LP. We launched a PAC, I wrote a content management system from scratch for voting on new platform ideas, and we got a bunch of like-minded people to show up at the LP convention in Oregon in 2006. By virtue of quirk in they bylaws (which I had to fight to preserve on the bylaws committee) we were able scrap the anarchist platform the Libertarian Party had built over decades. But we were not able to enact a politically palatable libertarian platform, nor were we able to repeal the membership oath which pledges new members to be irresponsible anarchists whether they realize it at the time or not. And so the Libertarian Party remains small and I have left the Libertarian Party and allowed myself to contemplate and promote what I truly believe vs. any party line. I still favor more liberty, but I’m game for a bouncy safety trampoline for the poor, strong environmental protections, even a bit of morality enforcement – albeit well below the standards required for true Christians. You will find my current ideology elsewhere on this site (along with variations for those who have differences in values). Here is the earth shaking bit: based on my rather informal market research, I am now closer to today’s political center than the Libertarian Party would have been had I been more successful. I might well be closer the political center than either of the legacy major parties. If I am correct in my measurements, there is a sweet spot on a different 2D political map that is screaming to be occupied. The market is crying out for a new political party which is bigger then either the Democratic or Republican parties. I’ll show you this market niche in the next chapter. You might be within it yourself.